On 23rd June 1956 the Slaugham church held a fete at Handcross Park. 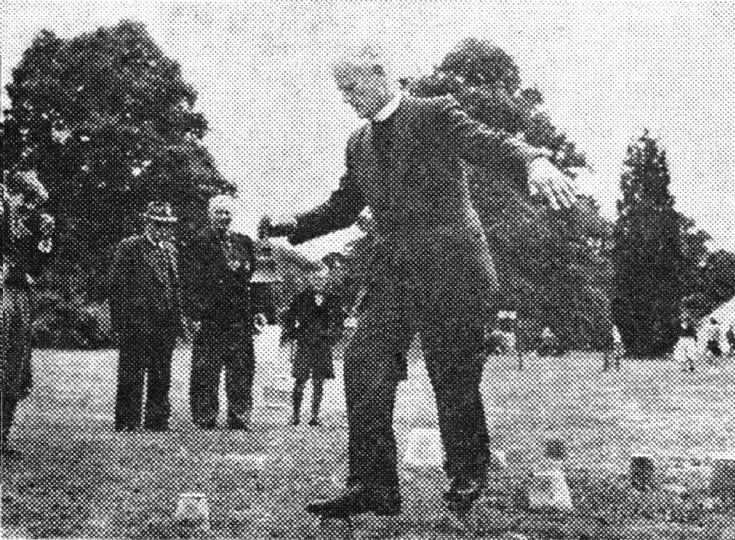 The photograph shows the Rev Edward Bradbrooke demonstrating his skills at vertical levitation; a skill not often seen in the Parish. Alas, it was not a miracle as on closer inspection he was standing on upturned flower pots! I cannot recall the event, but certainly I would have been a member of the local scout team which gave a demonstation of marbles on a portable ring. I still have the 6 feet diameter ring, but it is now in a sorry state of repair. The team won the junior marbles national championship for six consecutive years from 1952 to 1957, A video of our first win can be found at picture #1817. The Large Version shows a newspaper cutting of the fete. Select Open Document to view the programme for another Slaugham church fete, held at Handcross Park on 26th June 1954. The fete was opened by Gwendoline, Lady Benn, J.P. (1881-1966). Her son was Captain Frederick Christopher Benn who lost his life in 1941, just four years after marrying Phyllis Preston, later of Slaugham Park. His final resting place is at El Alamein in Egypt.